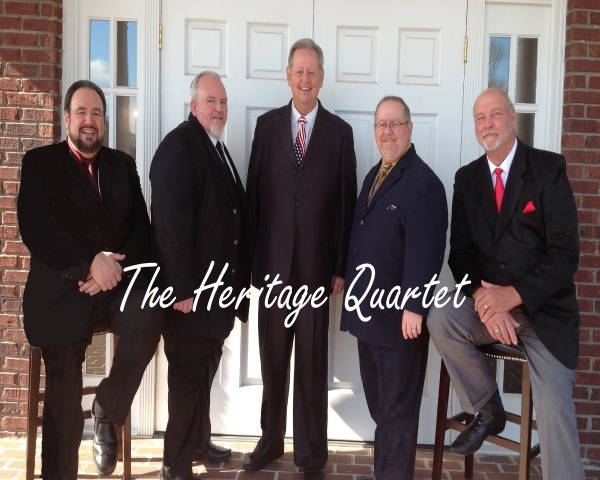 This is the Official Home Page of The Heritage Quartet. We would like to begin by thanking you for taking time out of what we know are very busy schedules to visit our web site. We're sure that in this day and time that you are being bombarded by requests by many different speakers and singers wanting to help you with your ministry needs. We hope the time you spend here with us will be informative and that you'll want to visit with us here agian in the future. If we may, please let us tell you a little about our ministry. ​First, we are a Southern Gospel Quartet from Lancaster, SC. We are celebrating our forteeth years in the Music Ministry proclaiming the love of God through song. If you look individually at our music and ministry background we have more than 75 years of combined experience in the ministry. We closely resemble the quartets of the old days with the low bass, high tenor and the smooth tight harmony in the middle. The thing we are most proud of is "The Ministry" that God has put together in a marvelous way. Though we want to have the smooth quality quartet sound that you've become accustomed to, WE WILL put God first in all our ministry opportunities. Whether it's in church, concert hall, restaurants, or a convenience store there is nothing more fulfilling than sharing God's word in song. This is why it is so very important to us that after visiting this site, we would like you to prayerfully consider us for your next music ministry event that you feel you might need a Southern Gospel Quartet. Even if you feel that we may not be what you're looking for at this time, please continue to remember us in prayer as we humble ourselves to the Will of God. So, while you're here, take some time and look around. We're sure you'll find something you'll like. Add us to your favorites and come back and visit with us as often as you can. Thank you and may God bless you for your efforts. The New CD's Are Here!!! "Where The Music Always Points To The Cross"
March 23, 2019 - CCS @ Grace Nazarene Church (W- Echos of Mercy) - 1029 Mt. Gallant Rd. "Click On Link To View The Concert Flier"